This week’s giveaway is brought to you by the amazing online store, Shabby Apple! I absolutely adore their modest clothing, accessories, and swim line! 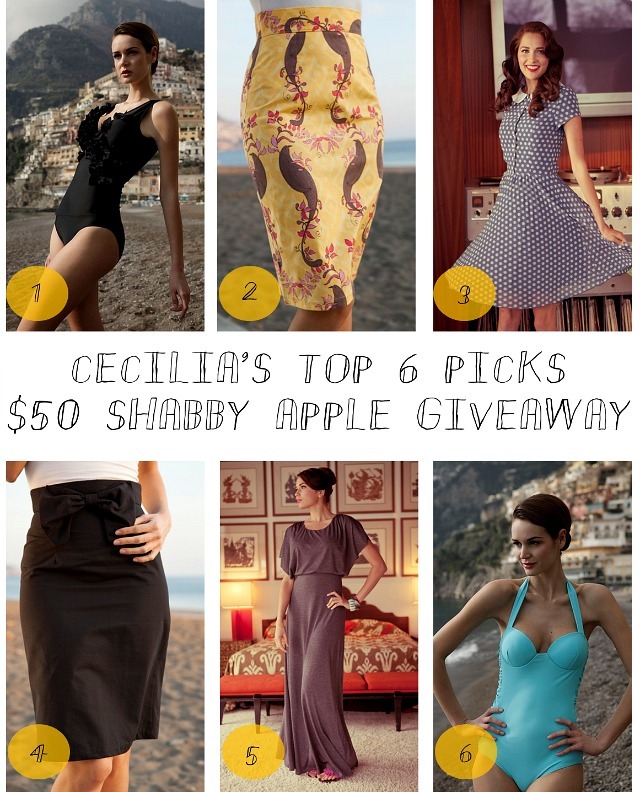 One VERY lucky Dearest Lou reader is going to win $50 to Shabby Apple! The giveaway will end July 9, 2012 @ 12:01AM EST. PS: If you want to go ahead and start shopping, use code dearestlou10off for 10% off your order! Congratulations Chelsea & Kelsey (I'm honestly not sure who entered since the comment is signed kw but the entry on rafflecopter says Chelsea)! I'm so happy for you and I hope you enjoy your $50 certificate to Shabby Apple. Now you can put the money towards that Hyannis Striped Skirt you had your eye on (; I will be emailing you sometime in the next little while so look out for my email! I want to thank everyone who entered for a chance to win! Be sure to check out the current giveaway HERE and enter for a chance to win a gorgeous print from Alexandra Wallace! I love the V.P. dress! Please visit http://www.mfashiondiary.com and follow when you get the chance! Please visit my blog http://www.mfashiondiary.com when you get the chance! Thanks! My favourite one has to be the one you mentioned: http://www.shabbyapple.com/p-1530-blue-eyes.aspx, it's totally my style! i just love the hyannis striped skirt. I love the Francine skirt! What an awesome giveaway! I love the third dress you picked, but I think I love the aqua version better. Thanks dear! My favorite is the Lake Titicaca Dress - Peter Pan Collar & Ruffled Kick Pleat need I say more? this dress would be lovely. I like the Francine and the Izzie - both of which are on sale!!! Awesome giveaway - I love Shabby Apple! I think this dress would be sooo cute for work! I love Shabby Apple so much! The Toe the Line dress is amazing! I love that all the bloggers I follow are pairing up with Shabby Apple! I love all their clothes and accessories! OH i love shabby apple! My favorite item is the flying crow jacket in their fitness collection! I love the Tanglewood Dress! The Tulleries dress is adorable! Thanks for the giveaway! The Tulleries dress is adorable! I love the Beachcomber Dress. I love the Marachino swimsuit! Thanks! I love the new lighthouse collection, especially the skirts. Too many to pick a favorite! I love the blue eyes dress. Ive been obsessed with the "one for my baby" dress since the twin palms collection came out! Awesome giveaway. Oh how I wish I had a US mailing address so I could enter this!!! the "confidential" dress is amazing! Oh gosh! Difficult to choose! Oh I love all their dresses! I like the Freshwater Pearl dress. I love the Caterpillar skirt and I also love the Danty Doll shoes. So cute! My favorite dress is Rosso!! I love the tuileries dress! that color is just gorgeous. Ok well I kinda love everything in this store. I really like the coral bangles though - I need some arm candy! It's gotta be Blue Eyes!! !